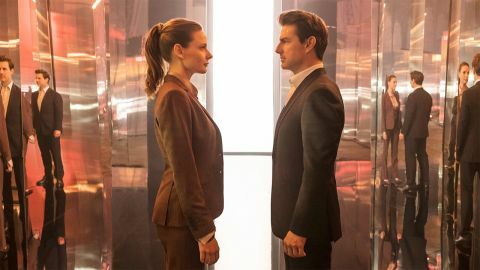 Mission: Impossible - Fallout review: "This quick-witted, fleet-footed franchise shows no sign of flagging"
There have been five previous Mission: Impossible movies, each fashioned by a different director who’s been actively encouraged to bring his signature style to the franchise (hiring a female filmmaker seems to be the most impossible mission of all). Fallout breaks from this admirable quest for freshness, with Christopher McQuarrie, the director of fifth installment Mission: Impossible – Rogue Nation, returning to the chair, perhaps indicating that producer/star Tom Cruise is this time ready to play it safe. No chance. The trick here is that McQuarrie – “McQ” to his leading man, whom he also directed in Jack Reacher – has no interest in repeating the elegant storytelling and suspenseful set-pieces that brought such old-school sophistication to Rogue Nation. Fallout, as the title suggests, is a more sprawling, robust, chaotic affair, crashing from Belfast to Berlin to Paris to London to Kashmir in a flurry of visceral action sequences that punctuate a narrative so twisty it doesn’t so much spin heads as snap necks. The plot, should you choose to try and keep up, involves our IMF hero Ethan Hunt (Cruise) being given 72 measly hours to grab three nuclear cores that are on their way to The Apostles, a splinter cell of terrorists set up by Rogue Nation baddie Solomon Lane (Sean Harris). Hunt and his trusted teammates Luther (Ving Rhames) and Benji (Simon Pegg, who this time gets to fire machine guns, scuba dive and more) botch the job with terrible consequences: nukes go off in Rome, Jerusalem and Mecca. And so Hunt goes into action again, this time accompanied by CIA watchdog Walker (Henry Cavill, all muscles, malignancy and moustache), who's presumably named after Point Blank’s similarly implacable antihero played by Lee Marvin. Hunt’s first task is to cosy up to arms dealer White Widow (Vanessa Kirby), and then… well, best you take the corkscrew journey for yourselves to discover how the dizzying plot accommodates players old (Harris’ anarchist Lane, Rebecca Ferguson’s MI6 agent Elsa, Alec Baldwin’s government honcho Alan Hunley) and new (Angela Basset’s CIA chief Erica Sloan, Liang Yang’s fist-flinging terrorist, Kristoffer Joner’s nuclear-weapons expert Nils Debruuk). There are double, triple, quadruple crosses… Whenever Ethan mutters “I’ll figure it out,” he’s referring to the perilous stunts he has to tackle on the fly (literally, in a couple of cases), but viewers might wish to apply his amusing catchphrase to the thrillingly clever story. But we mentioned stunts and… wow, just wow. Impossibly dangerous set-pieces have always been this franchise’s mission, with M:I’s chopper-in-the-Chunnel collision, M:I - 2’s cliff-face dangle, M:1 - 3’s bridge battle, M:I - 4’s Burj Khalifa climb and M:I - 5’s plane-clinging takeoff raising the bar for action cinema. Well, M:I - 6 serves up belter after corker, from a stomach-knotting HALO jump to knuckle-whitening motorbike and car chases to Cruise, the greatest sprinter in the movies, pumping those arms and legs to propel himself up, around and over St. Paul’s Cathedral, then past Tower Bridge and up to the very summit of the Tate Modern. Hollywood's leading man does it all himself, naturally, even breaking an ankle during one full-pelt leap between rooftops, and he also – madly, unbelievably – stunt-pilots a chopper in a truly kamikaze pursuit. Add in a fair amount of humour and some exploratory emotion as Hunt, hitherto a cipher, gets to exhibit a little soul beneath the superspy, and you have, improbably, the finest Mission yet. You’d be crazy not to accept it.